This is it! The moment I’ve been dreaming of since I was 14. I have a published wargame! 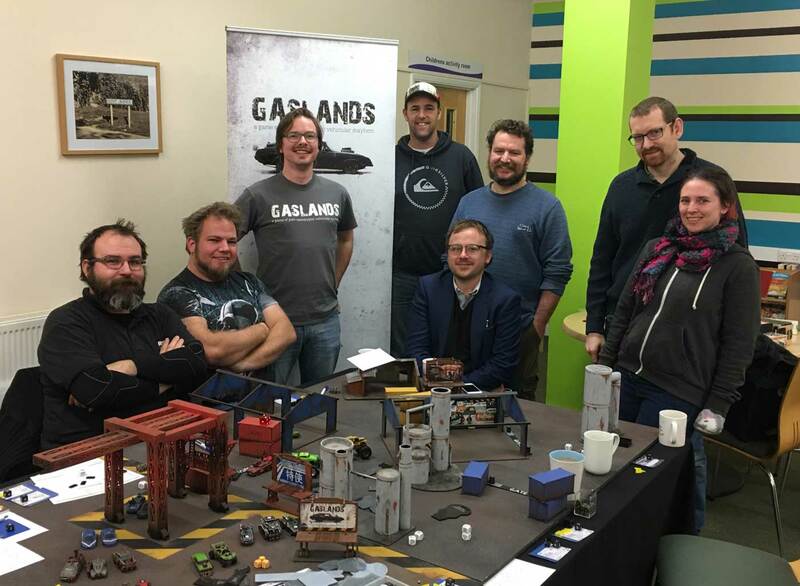 After two years of iterations, playtests, rewrites, demos and more iterations, Gaslands is finally real! 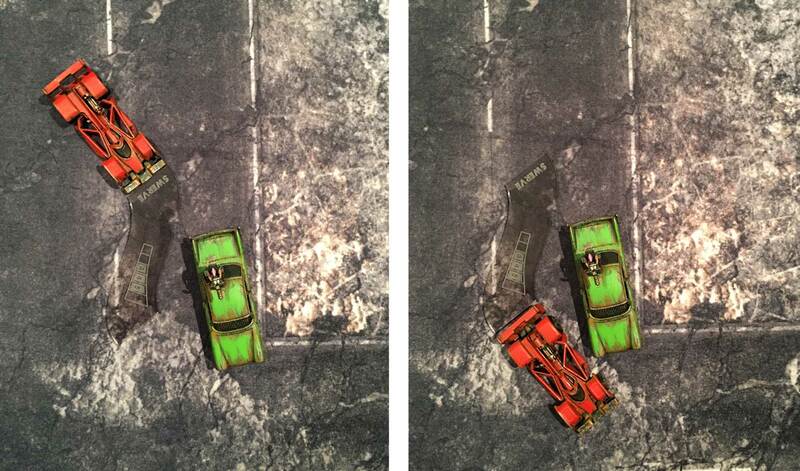 With the release of Gaslands today, I wanted to tell you about the heart of the game: the manuever templates. You use these to move the vehicles around the table, and the options available to you change as you change your speed. 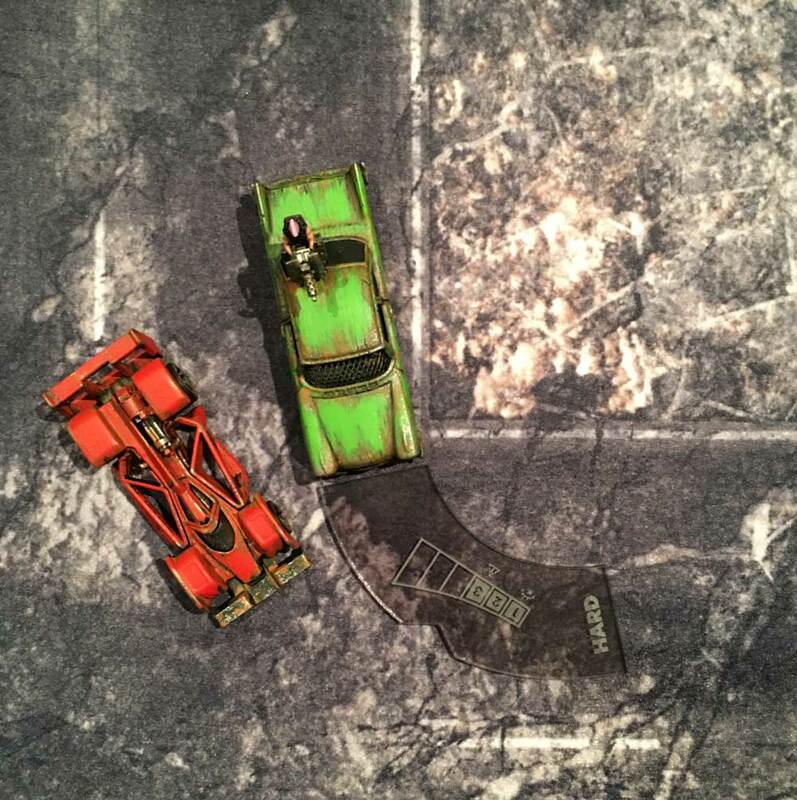 There are nine manuever templates in Gaslands: gentle, turn, hard, hairpin, veer, swerve and three lengths of straight, short, medium and long. On each manuever template, a set of icons indicate which gears a vehicle must be in to be permitted to select this template. You have to be in one of the highlighted gears to select the template. For example, a vehicle in a low gear cannot select the long straight template, and a vehicle in a high gear cannot select the hairpin template. This provides a quick and visual way to constrain the movement of faster-moving vehicles, without getting bogged down in tables or calculations. You just check your current gear, and then look for templates with that gear number highlighted. It also means that if you want to take a sharper corner, you will need to break: shifting down a gear to unlock access to the turn template that you need. In doing so, you may be losing the opportunity to activate in higher gear phases later in the turn, but that may well be preferable to smashing headlong into a barricade! As well as indicating the permitted gears, the icons on the maneuver templates also show whether or not you get a free shift or hazard result for selecting that template in that gear. You can read more about what shift and hazard results do in the article on Skid Dice. For example, if you are currently in gear 3, you can select the hairpin template, but it’s going to give you a hazard token if you do, as that is a tricky maneuver to pull off safely at higher speeds. If you haven’t already, you can read more about hazard tokens here. The free shift icon on a medium straight template, for example, can be really useful in play. If you just need to shift up a single gear in order to ensure you will activate in the next gear phase, and you aren’t feeling great about risking the skid dice, a cautious player can simply take the free shift icon off the template and shift up a gear without rolling any dice. You will take a hazard token for doing so, with no skid dice results available to cancel it, but it eliminates the uncertainty and can be a great choice. When it is your turn to activate a vehicle, you survey the available templates and select one, prior to placing it down and then rolling your skid dice. Be careful though: if you touch a template YOU HAVE TO USE IT! Worse still, if you touch a template that you’re not permitted to use, the player to your left gets to select and place a template, which is pretty much guaranteed to see you career into a wall. The higher gear you are in, the more times you get to activate in a tern, but the fewer options you have available to you in terms of manuever templates. 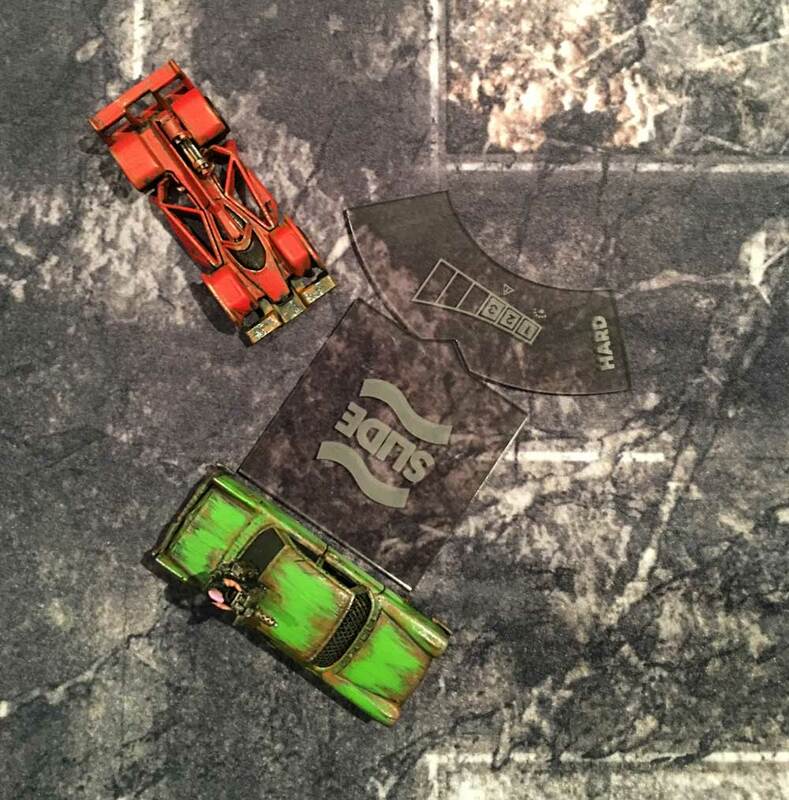 The skill in Gaslands is choosing the right times to accelerate and brake to get yourself the maximum number of activations, each in the right gear to allow you to select the template you need whilst taking advantage of the free icons on the template. It’s worth pointing out that the manuever templates also double as range finders for shooting attacks. This is important only because it means that the whole game of Gaslands is scalable up or down as you choose. If you want to play Gaslands with 28mm vehicles, just scale all the templates up by 140% and the game will play just right. 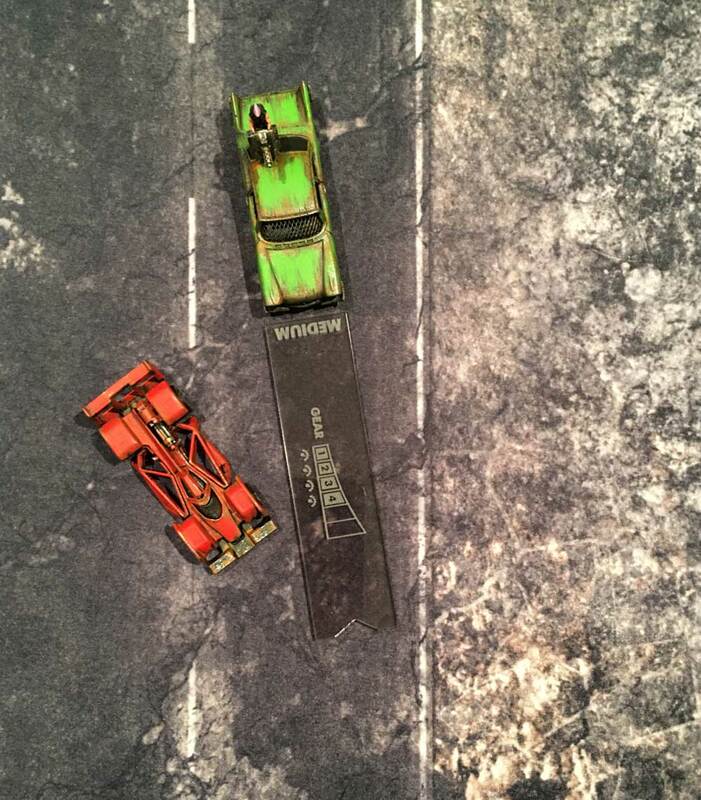 If you want to play Gaslands at a “Micro Machines” or 10mm scale, just scale all the templates down by 70%. As there is no measurement of distances other than using the templates, everything will work perfectly. If you are thinking: hang on, these movement templates seem a little restrictive… where’s the hand-break turn!? Fear not, check out our article on how the Skid Dice interact with the maneuver templates and you’ll see that you have all sorts of options to make very fluid and cinematic maneuvers with your vehicles. I’m off to play some more Gaslands. My game, that it’s real and now available to buy. I can’t believe I got a game published. I cannot believe it! Many thanks to Cigar Box Battle for use of the lovely 4’x6′ City Fight mat that you see in these photos. It’s a really nice mat!